It’s stupid. Of course it is. Hell, the name of the film is Dumb and Dumber To; if you go in expecting high art after knowing what it’s called, we honestly don’t know what to tell you. This is a stupid, silly and – yes – dumb little comedy… and, in all honesty, that’s why it’s so damn enjoyable. Much like its predecessor, which is now unbelievably twenty years old (and for those about to mention the 2003 prequel Dumb and Dumberer, pipe down before you get hurt), its main goal is to throw every dim-witted joke at you while trying to get you to crack a smile, and succeeding to a certain degree. With today’s modern obsession with having every major film be smart and engaging like most of Christopher Nolan’s work, causing a sigh of relief is the fact that somewhere out there, filmmakers like the Farrelly brothers are still committed to making brain-dead material with that lack of pretence that somehow still manages to work in its own little way. This is different to, say, your typical Adam Sandler/Happy Madison production where their brain-dead material got in the way of everything else that makes a stupid comedy work, such as jokes and especially character; somewhere in between all the gross-out gags and the idiotic sense of humour, there has to be a balance otherwise it just looks like a group of oversized man-babies rolling in and drooling on piles of money (by the way, isn’t that just Happy Madison in a nutshell?). 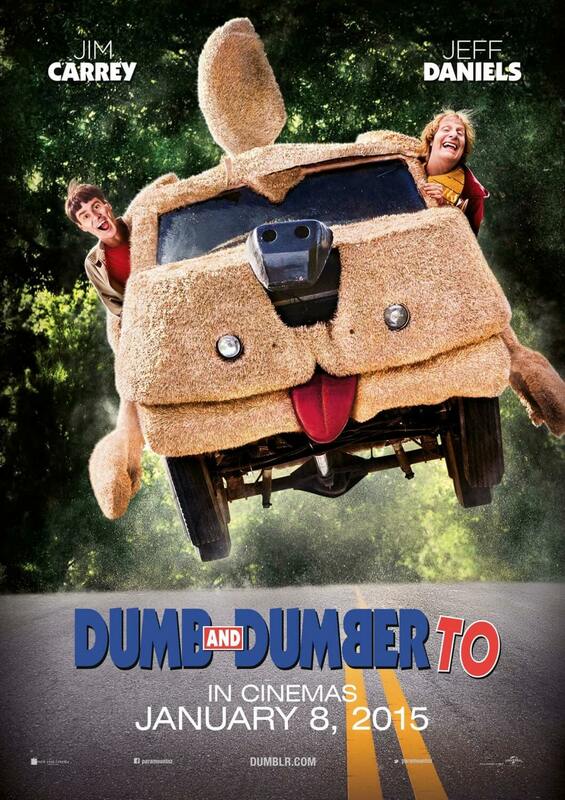 This film is far more enjoyable than anything Sandler and his partners in crime have mustered up in recent years, because it actually keeps the focus on what made Dumb and Dumber so memorable in the first place. What, you may ask? Why, Dumb and Dumber of course! Jim Carrey and Jeff Daniels slip back into their respective roles of Lloyd Christmas and Harry Dunne with such ease you’d hardly think that time has gone by at all, and despite more wrinkles on their skin they’re mentally younger than ever before, which – for a film called Dumb and Dumber To – can only mean joyful things for the paying audience. Carrey and Daniels still have an enjoyable chemistry and, despite some of their more dangerous pranks and selfish moments, still emit enough likability that you want to see them do well in the end. The film keeps itself fixated on whatever hair-brained scenarios they find themselves in, which is where a lot of the comedy comes from. Does it all work? Not really, there are one or two that simply don’t meet the mark, and those who feel Carrey to always be mugging for the camera in all of his movies will DEFINITELY not like him here (though it bothers us none); but for whatever reason the sheer stupidity of these two characters is what makes them so entertaining to watch. Even at their cruellest, it doesn’t feel intentional of them to be so mean; they’re just a couple of morons who don’t know any better. Hey, that’s how they were in the original, so all is well and stupid. Carrey and Daniels’ antics are arguably the main reason anyone would go and see this film, so when the film feels obliged to throw in a more conventional plot in the mix, as was again the case first time around, it falls a little more flat. Now, we don’t necessarily mean the core story of the two heading out to find Daniels’ long-lost daughter (Rachel Melvin, a worthy competitor against Carrey and Daniels in the “acting stupid” ranks), that one plays out fine; it’s more the B-plot, which is a surprisingly complex murder scheme involving the wife of a scientist (Laurie Holden) and the twin brother of a special forces operative (Rob Riggle, in a dual role as both). Once more, this is in keeping with the first film where the antics of the two protagonists somehow led them to become involved in a villainous scheme, but be honest with yourself: do you really give a crap about the villains? Of course not, because the main attraction is always the behaviour of these two very dumb individuals and not whatever else is going on. Same thing here, as you find yourself not caring about what they’re doing or even why they’re doing it; you’re more invested in just the friendship of Harry and Lloyd than anything else, and unless it involves them directly then there’s no reason to give a toss. Oh, and did we mention the film pauses at one point to focus on Holden feverishly slobber all over Rob Riggle’s feet? Yyyyyup. She was in The Walking Dead, folks. The plot matters not if you’re just having a good time despite the silly material, and Dumb and Dumber To does offer an enjoyable fun ride for anyone who just wants to see an amusing comedy that doesn’t require much thinking power. Fans of the first film will certainly find things to enjoy about it, from the brief return of Harry’s iconic “Mutt Cuts” vehicle to a post-credits cameo from an antagonist from the first film, though for its harsher critics it will certainly not sway you. As an alternative to the Happy Madison line of dumb comedies, it’s one that’s worthwhile thanks to its fixation on the pairing of Carrey and Daniels as these two popular characters and a genuine sense of passion for its sheer stupidity. There’s no cynicism on display here; if you desire to escape your real-world troubles then come along and see that no matter how tough it gets, at least you’re not as dumb as Lloyd Christmas and Harry Dunne.